Headquartered in Woodstock, Illinois, Charter Dura-Bar focuses on continuous cast iron bar products that are used as alternatives to carbon and alloy steel for industrial applications such as drilling and hydraulic fracturing in oil and gas. The company is comprised of two divisions. Dura-Bar is the world’s largest producer of engineered cast iron bar products – and the only continuous cast iron bar foundry in the United States. 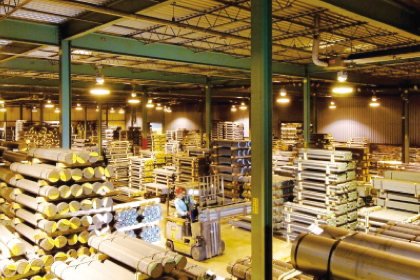 Dura-Bar Metal Services is Dura-Bar’s largest distributor, serving more than 3,000 global customers from locations in Illinois, Pennsylvania, Texas, and North Carolina. Charter Dura-Bar boasts a picturesque campus. A lake and plenty of green space surround its three main buildings, which house administrative functions, metal services, and an iron foundry. Its somewhat rural location, coupled with the large amount of steel and cinder block walls in the foundry, made it difficult for cellular signals to penetrate indoors. As the company’s 10 small cells began to reach the end of their lifecycle and the carrier no longer supported the offering, Charter Dura-Bar was on the hunt for a new solution. On the recommendation of their carrier, Charter Dura-Bar turned to KonectaUSA, a leading provider and installer of indoor cellular solutions. KonectaUSA decided to use the Cel-Fi QUATRA active DAS hybrid from Nextivity to build out Charter Dura-Bar’s cellular network. A Cel-Fi QUATRA Network Unit (NU – the head-end of the active DAS hybrid) was installed to deliver Verizon and AT&T signals to four Coverage Units (CUs – the internal antennas that rebroadcast the signal inside the building). Three CUs provide coverage to the offices, including one CU that is cabled to two passive dome antennas for a cost-effective solution to feed signal to the cafeteria where the vending machines were located. The fourth CU was used to cover the large engineering area (50 x 100 square feet) with cinder block walls. Charter Dura-Bar now has a separate, secure network to handle vending machine orders. Operationally, the company has seen a number of operational benefits. Pre installation readings went from -120 and -110 to post installation readings of -85 and -75 throughout the different buildings, and capacity is no longer an issue—every employee now enjoys coverage.